Rita began her career at Columbia Pictures with the movie Criminals of the Air. By the time it was released she was known as "Rita Hayworth". Most of the first two years at her new studio Rita spent being rushed into the lowest budget "B" pictures one after another, often with the same co-stars, her most frequent being Charles Quigley. Films such as Girls Can Play, Who Killed Gail Preston? and Convicted were some of these "quickie" productions. Filmed at lightning speed, they were more like B minuses but at least they were a source of steady work for her. Between making these films, in the Irving Briskin unit of the Columbia lot, she spent endless hours having publicity shots taken in the portrait gallery. Then in late 1938, director Howard Hawks began looking for an actress to cast as Judy MacPherson in his upcoming film starring Cary Grant and the reigning queen of Columbia Pictures, Jean Arthur. This is an episode in Rita's life that has at least half a dozen variations, but the most likely story is that after Hawks made a screen test of her, Rita got the part. The movie was Only Angels Have Wings. It was Rita's best film to date and gave a much-needed boost to her career. It made her name much better known and convinced studio head Harry Cohn to begin building up the publicity on her. She started getting better roles and began to be sought after by other studios for supporting roles in "A" films. the parted on the left side hairdo which she maintained for the better part of her career. In 1939 and 1940 she starred in Music In My Heart, appeared in one of the installments of Columbia's popular Blondie series, Blondie on a Budget, and then was loaned to MGM for a featured role in Susan and God, starring Joan Crawford. Afterwards however, it was back to Columbia where she made her first movie with Glenn Ford, The Lady in Question, a cute film in which Rita gives one of the best performances of her early career. She would go on to make four more films with Ford in which they would become one of America's favorite screen couples. This film was also her first directed by Charles Vidor, her favorite director. After that, she starred in Angels Over Broadway with Douglas Fairbanks Jr. Her next two movies were for Warner Brothers. The first of the two, The Strawberry Blonde, was a big success and gave Rita another boost toward stardom. This was also the film in which her hair was dyed a shade of red for the first time. Unfortunately, the film was made in black and white. Next she made Affectionately Yours. It was not nearly as successful as her first movie for Warner's, but she was getting better. With every film under her belt she was becoming more at ease in front of the camera and showing Hollywood she could make the transition to major film star. After her success in The Strawberry Blonde, Warner Brothers attempted to buy her contract from Columbia. The fact that Warner's wanted her and Columbia would not sell, shows that Rita was beginning to be seen as a hot commodity in the industry. Shortly after, she beat out dozens of actresses for the prize role of Doña Sol in Twentieth Century Fox's Blood and Sand. Reportedly, Fox studio head Darryl Zanuck's original choice was Carole Landis, but she turned down to role, saying she had spent too much time working on her "blonde bombshell" image to have it reversed by appearing as a redhead in the Technicolor production. Others considered included Gene Tierney, Hedy Lamarr and Maria Montez. The director, Rouben Mamoulian later said, "...the moment I saw Rita Hayworth walk I knew I had my Doña Sol". Thus, Rita landed the star-making role of the temptress in Blood and Sand. The picture, her first in Technicolor, co-starred Tyrone Power, Linda Darnell and Anthony Quinn. 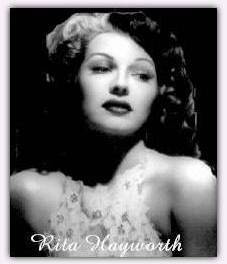 It's success made Rita Hayworth Hollywood's hottest new star. 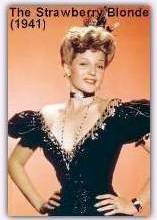 With her new "star" status came a new contract, dressing room and a role opposite Fred Astaire in You'll Never Get Rich. She had begun her reign as queen of Columbia Pictures. Nevertheless, for her next two films, she was again loaned to Fox. First to replace the overworked Betty Grable in My Gal Sal, then to be one of the stars of the all-star cast movie, Tales of Manhattan. 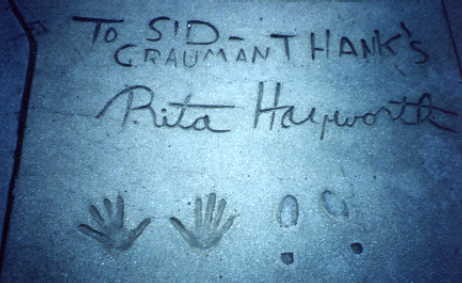 It was in connection with the latter of the two that on July 24, 1942 Rita immortalized her hand and footprints in cement in the forecourt of Grauman's Chinese Theater. Then it was back to Columbia where she was reunited with Fred Astaire for the classic musical, You Were Never Lovelier. She and Astaire made a electrifying screen duo. Their two numbers in the picture, "I'm Old Fashioned" and "The Shorty George" are a sight to behold. Although his onscreen partnership with Ginger Rogers was his most famous collaboration, Astaire said that Rita was his "favorite" dance partner. Lovelier were the "jewels" of her career. By this time The United States had entered World War II and the GI's at home and abroad made Rita one of their favorite pin-up girls. She showed her appreciation to them in many ways, including her many appearances at the Hollywood Canteen where she danced with them until dawn, washed dishes, made sandwiches and served coffee. She also appeared in many USO shows put on for the troops. Not to mention how much her movies helped boost morale. About the time she made My Gal Sal, Rita was seeking a divorce from Edward Judson. The proceedings got nasty when Judson demanded money to get out of her life, for helping to advance Rita's career. He got a reported $30,000 from Columbia Pictures. Her divorce was granted on May 22, 1942. Rita's love life took a positive turn when she entered into a relationship with Orson Welles. It began at a party given at their mutual friend Joseph Cotton's house, but even before that it was already well known in Hollywood that Welles was infatuated with Rita, ever since he had seen her in Blood and Sand. Welles, who was in South America at the time, reportedly told a friend "I'm going back to America to marry Rita Hayworth." (He hadn't even met her yet!). After seeing each other at Cotten's party, it wasn't long before he won her over. On May 27, 1943 shooting began on Rita's next film, Cover Girl. 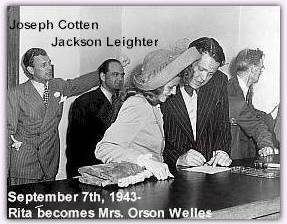 During the filming of this movie, on the afternoon of September 7, 1943, Welles picked Rita up at the studio and the two were wed. Their close friends Joseph Cotten and Jackson Leighter served as witnesses. The marriage plans were kept secret. Back at Columbia, studio personnel didn't know about it until they read it in the papers. The next day, Rita returned to work on Cover Girl. The picture was a Techni-colorful musical, one of the greatest hits of the year. She was now one of the biggest stars in Hollywood and happy with her new husband. 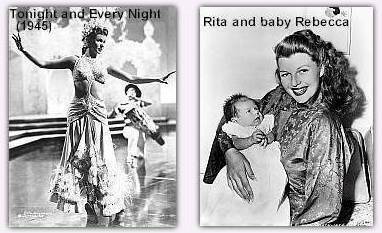 Following production of Tonight and Every Night, Rita gave birth to her first child, daughter Rebecca Welles, on December 17, 1944. According to many friends and co-workers, this period in Rita's life, when she was being courted by Orson, through the early days of their marriage and Rebecca's birth, were the happiest. dance numbers were filmed early on, before the pregnancy began to show. The next year Rita was back at work. 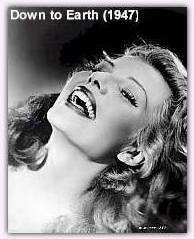 In September of 1945 production began on the movie that has become synonymous with Rita Hayworth, Gilda. Her rendition of "Put the Blame on Mame" caused a problem with the censors who called her dance a "striptease" (All she actually takes off is one glove). 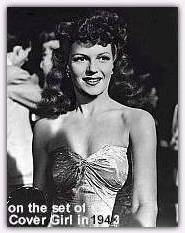 Her performance in Gilda made such an impact that, depending on which sources you read, either the name "Gilda", or Rita's picture was put on the side of the atomic bomb that was tested at Bikini Atoll on July 1, 1946. Rita later said, "I hate war...that whole bomb thing made me sick to my stomach" After the release of the film in 1946, it began setting box office records and made Rita the most well known star in the world. 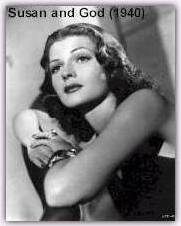 Since then she has always been associated with "Gilda", despite the fact that those who knew her say she bore no resemblance to the character in real life. A famous statement she made to Gilda producer Virginia Van Upp is that, "Every man I have ever known has fallen in love with Gilda and awakened with me." Her next picture was Down To Earth, a fantasy musical which showcased a never more beautiful Rita as Terpsichore, goddess of song and dance. Rita was at the height of her fame and it was exactly how the public wanted to see her, so of course it was a box-office smash. 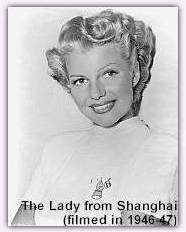 Next she starred in a movie Orson Welles produced, wrote, directed and co-starred with her in, The Lady from Shanghai. Unfortunately, there were problems in the marriage and Rita and Orson were separated long before production began on this film (They had separated during the making of Gilda). Rita had complete confidence in Orson's film-making abilities. Like many in Hollywood, she regarded him as a "genius" in his field. They got along well during the making of the movie, but just weeks after it was completed, Rita filed for divorce. The Lady from Shanghai, filmed at Columbia in 1946 and early 1947, introduced the world to a partially re-designed Rita. The short blond coif she sported in favor of her famous auburn tresses didn't fare too well with audiences. Although not what the movie-going public wanted to see from Rita, the new blond hair and the role of Elsa Bannister offered Rita a bit of a departure from the trademark Gilda image that she spent her life trying to escape. What is unfortunate is that once production wrapped, Orson left town and did not oversee the editing process. His notes on how the film was to be edited were basically all disregarded, making the finished product far from what he had envisioned. Not released until 1948, the film did not do well at the box office, but nowadays it is considered a classic, a film which most Hayworth fans, including myself, love. Not surprisingly, it was also one of Rita's favorites. By now Rita had discussed a new contract with Harry Cohn in which she would receive a portion of the profits her future films made. Through the contract she formed her own production company, Beckworth (a combination of her daughter's name and her own last name) and her next film, The Loves of Carmen was produced by it, then released through Columbia. Having the film produced by her own company allowed Rita to make the venture a family affair. Her father was brought in to help choreograph, her Uncle José was one of the gypsy dancers in a scene, and her brother Vernon was given a small part as a dragoon. Her performance as Carmen was one Rita was particularly proud of. In spite of Rita's newfound professional leverage, once the production was complete, she set sail for Europe, not saying when she would return. She had met her Prince Charming. At a party in Cannes hosted by Elsa Maxwell, Rita was introduced to Prince Aly Khan. It was July 3, 1948. 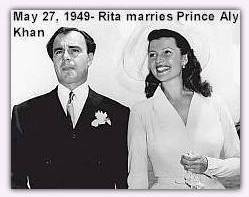 After one of the most highly publicized courtships in history, on the 27th of May, 1949 Rita Hayworth became princess to Prince Aly Khan. She left Hollywood in the past and took up residence with her new husband in Europe. The press covered every move the royal couple made. On December 28, 1949, in Lausanne, Switzerland Rita became the mother of Princess Yasmin Aga Khan. Later Rita and the prince toured Europe and Africa. A movie was even made about their journeys called Champagne Safari. Unfortunately, the marriage was not the fairytale it appeared to be. Among other things, Rita and Aly's lifestyles were so different. He was a prince. His world was luxury and lavish parties, things that did not much appeal to Rita. She couldn't accustom herself to life as a princess or all the responsibilities that came with being the wife of Aly Khan. On March 25, 1951, Rita and her two daughters, set sail back to America on the luxury liner De Grasse. The couple briefly reconciled during 1952, but it didn't last long. By January, 1953 Rita and Aly Khan were officially divorced. After the separation, Rita reluctantly went back to Hollywood. She needed money and therefore had to resume her career. 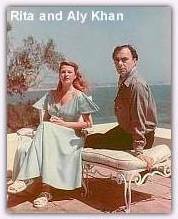 When she had married Aly Khan she didn't plan on being Rita Hayworth, movie queen anymore. Away from the screen she just wanted to be Margarita, not Rita. She even preferred to be called Margarita, and she often let her hair grow in its natural color. But it was 1951 and she was back at Columbia Pictures, where she went into production of Affair in Trinidad. The director, Vincent Sherman, remembers Rita seeming "rather frightened at the approach of doing another picture". On film it didn't register. From the moment she appeared on the screen, singing and dancing to "Trinidad Lady", she was every bit "The Love Goddess". During Rita's absence from films she hadn't lost any of her appeal to the movie-going public. Her first movie in four years became a bigger box office hit than Gilda. Her next movie was one of her least favorite, Salome, in which she played the biblical siren of the film's title, co-starring Stewart Granger and Charles Laughton.